This year marks the 40th year of the Cross Fork Snake Hunt. 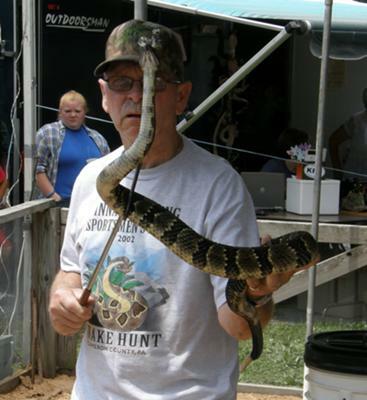 During the weekend of the Snake Hunt, hundreds of people come from all over Pennsylvania and the surrounding states to the small town of Cross Fork (population 129) to hunt the venomous rattlesnakes that frequent the area, watch the hunt and have fun in “the biggest little town in the world.” The event is organized by the Keystone Reptile Club. Children’s activities include a snake race, snake challenge and fake snake hunt, as well as a kids pit where they can handle snakes safely under the supervision of the Keystone Reptile Club, as well as educational lectures and Q&A periods. Other events held over the weekend include a parade, horseshoes tournament (6th Annual), bike show (7th Annual), raffles and many vendors. Proceeds benefit the Kettle Creek Hose Company and the Sinnemahoning Sportsmen's Club. For more information, visit www.kettlecreekhoseco.com. Thank you for giving us all the information to attend the 40th Annual Cross Fork Snake Hunt in June, 2012.